Planet Bike's original Super Flash was the first bike taillight to use a high-powered LED that did more than just subtly wink at the cars driving by. 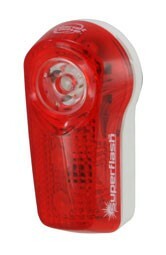 Designed with a powerful primary LED and two secondary LEDs to ensure that something's always flashing, the Super Flash lights use a unique attention-grabbing strobe flash to draw drivers' attention. This light is by all accounts the most popular one out there. It was one of the first super-bright LED lights to hit the market, and continues to be very popular. So how does it stack up against the modern competition? (Disclaimer – mine’s several years old, so although I did give the outside a good wiping down, and LEDs shouldn’t degrade over time, a brand-new one might perform better). As it turns out, the Super Flash isn’t the brightest light out there – it has reasonable visibility from the side, but is only about average in terms of brightness. What makes this light stand out isn’t the amount of light it puts out, but rather how it does it: the Super Flash was one of the first bike lights to implement a rapid strobing pattering to grab drivers’ eyes. Despite being dimmer than other lights, it caught my eye better than brighter but more mild-mannered blinky lights. With a 1/2 watt LED, it also runs longer on a charge than some newer, brighter lights do: In my testing, it remained very bright for 52 hours, remained visible for another 22, and was still flashing feebly after an entire week of runtime. Overall, the Super Flash is still a good choice, but at $24 you can certainly get something brighter. It may seem that the Super Flash’s reign is over, but Planet Bike is determined to hold their top spot, and the new Super Flash Turbo may do just that.